Alex Groarke is a research assistant for the LCMSDS and a student in HI 411, which toured Moscow and St Petersburg to investigate Russian war and memory. The collapse of the Soviet Union in 1991 did not instantly eliminate all traces of the communist years. Murals, totems and statues recalling the Soviet regime persist all over Russia. Public parks, roads and transit systems all echo Russia’s Soviet past. The most compelling memorials are the statue parks created in the wake of the Soviet Union’s collapse to house newly-unpalatable statues of important communist figures. 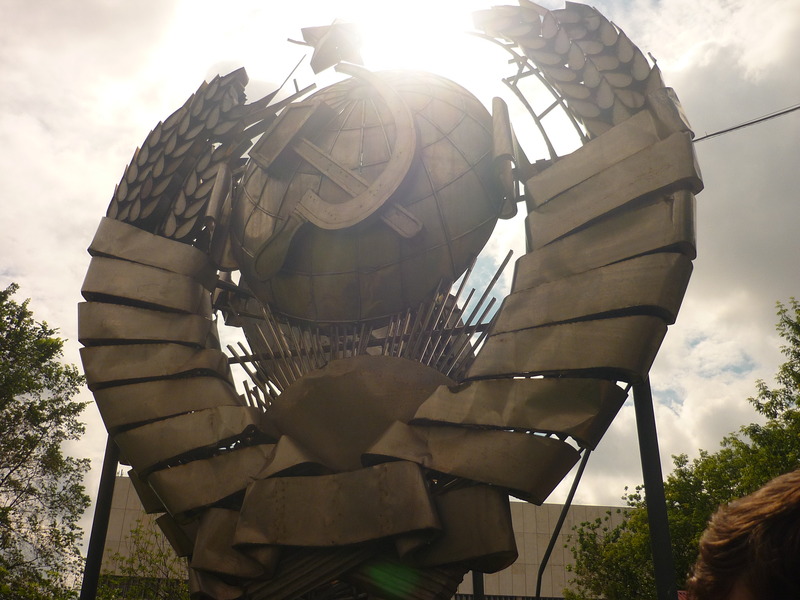 At first glance, these repositories of Soviet artifacts, which dot the cities of the former Soviet bloc, seem emblematic of this historical hangover. 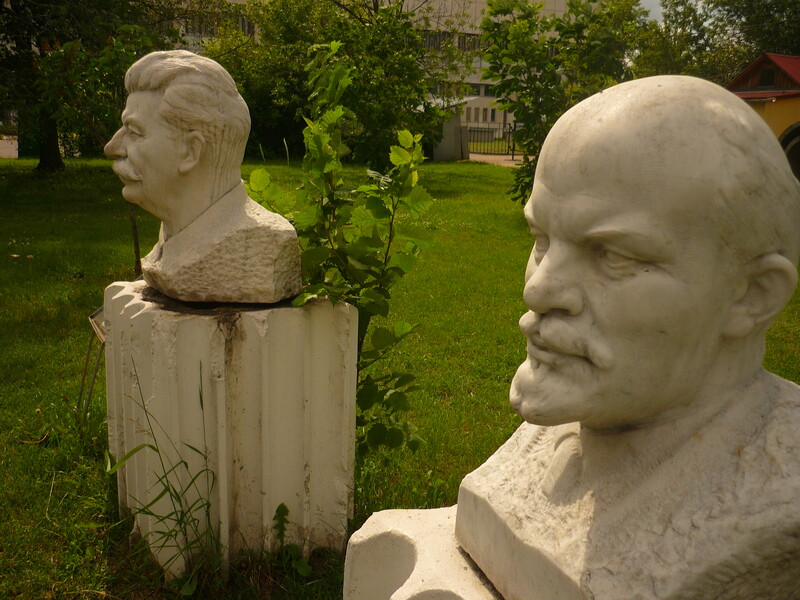 However, upon closer inspection, statue parks fundamentally alter the meaning of the figures enclosed within their borders from the Soviet context. ideologically-charged artifacts is even more politically significant than their initial creation. By uprooting and repositioning these statues from their pillars of prominence to an enclosed, out of the way grassy knoll at eye-level of passers-by, these figures “had yet another layer of meaning slapped on them,” and were thus “profoundly altered” from their original symbolic definition. Even more significantly, James reiterates Istvan Rév’s argument that the acceptance of new ways of interpreting the past necessitates a fundamental rejection and altering of traditional interpretations of history. Although James is describing the statue park in the Hungarian context, her arguments apply equally to Moscow’s Muzeon Park. Also known as Statue Park, or Fallen Monument Park in English, the grassy area was transformed into a way-station for Soviet-era statues which had become ideologically unacceptable after the collapse of the Soviet Union in 1991. Fallen Monument Park proves that, rather than attempting to destroy the cultural artifacts of the Soviet years, Russians have instead opted to displace them from where they once stood in prominence. This decentering of often-painful reminders of the Soviet past typifies the way that contemporary Russian citizens interpret their country’s past. The centrepiece of this section of the park is arguably a massive statue of Felix Dzerzhinsky, the Polish-born founder of the original Soviet police organization, the Cheka (OGPU, NKVD) that would eventually come to be known as the KGB. Also known as Iron Felix, the statue originally stood over the Lubyanka, the center of the secret policing apparatus in Moscow. The statue came to symbolize the wrongdoings of the post-October Revolution repression campaign of the Cheka in 1918 and, later, the power and fear that the NKVD evoked throughout the purges of high Stalinism. The statue was clandestinely vandalized throughout the Cold War, and toppled with great gusto in August of 1991. 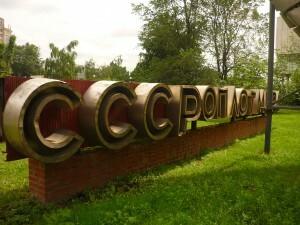 Across the section, near the entrance to the park, enormous Cyrillic lettering spells out the acronyms of the USSR on an aluminum backing of chipping red paint. Directly beside this slogan is an enormous, stylized two-sided hammer and sickle, which dwarfs all of the other statues in the park. The metal is corroded and lacking in colour, but even in this state the steel of the iconic symbol retains some of the authority it once commanded. Coupled with its size, the ultrarealistic wheat representing Soviet farmers, the metallic rods which act as the rays of the sun and the banners representing fifteen major linguistic groups inhabiting the USSR continue to evoke a powerful message. of Lenin’s head and full profile dot the area. Yet Statue Park is not without its share of ironies. Located directly beside the modern art division of the enormously significant Tretyakov Gallery, the park is also used to house the institution’s collection of modern statues. It is only here that one can see an imposing marble statue of Stalin directly beside dozens of emaciated figures meant to represent the victims of the worst excesses of the Stalinist regime. It is through juxtapositions such as this that Muzeon Park reinforces its jabs against the official Soviet version of history. By banishing these statues to an enclosed space, the Russian citizenry is not simply rejecting the figures they represent. By exiling the monolithic Dzerzhinsky from his perch at the Lubyanka, the Russians reject the Cheka, the OGPU, the NKVD and the KGB simultaneously for all of the bloodshed the various iterations of the Soviet Union’s secret police organ wrought upon the Russian people. 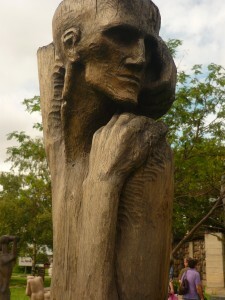 Similarly, the banishment of Stalin’s imposing figure from a place of prominence to an insignificant green space in the centre of Moscow represents a break with every policy associated with his reign, from the Communist Party purges to forced collectivization and the institutionalization of what Solzenhitzen termed the gulag archipelago. Statue Park represents both a literal and figurative rejection of the validity of Soviet history, especially as told through the Communist ideological cannon. This makes rumblings about plans to refurbish Iron Felix all the more significant. As James’ argument suggests, the statue park represents an important institution for coming to terms with the contentious history of the Soviet era. 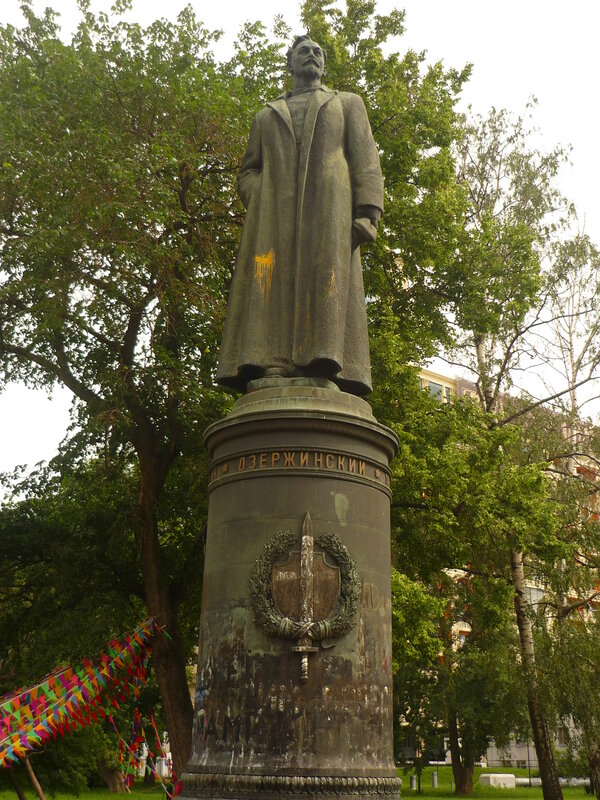 Plans to remove the graffiti from the massive Dzerzhinsky statue coincide with repositioning it on an imposing pillar and, most ominously, potentially replacing it to its old perch at the front of the Lubyanka. Similar plans to reinstate the founder of the KGB fortunately foundered in 2002. Meanwhile, the administrators at the Muzeon have resisted these state-led efforts by arguing that the graffiti on the statue is just as historically significant as the statue itself. Statue Park not only functions as a rejection of Soviet ideology; it is also a symbolic recognition that history does not evolve in a linear, ordinary fashion. It is also an acceptance that the present and future do not have to be defined by the mistakes of the past.The reinstatement of Dzerzhinsky would represent yet another important redefinition of history. As a further act of revisionism, this would overturn the rejection of Soviet excesses by the Russian people while simultaneously accepting these excesses as a necessary phenomenon in a linear evolution of history. Nevertheless, for the moment, Moscow’s statue park, and others like it throughout the former Soviet Union, provides an intriguing commentary on the importance of space in interpreting historical memory and its symbols.